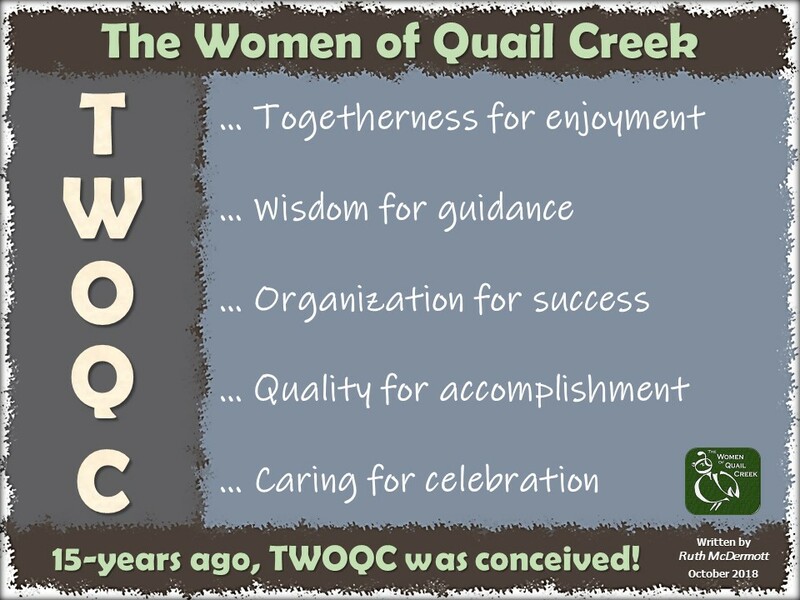 Here’s to a great 2018 and all the beautiful, sassy ladies of The Women of Quail Creek! We are more than 370 strong now, and I am looking forward to meeting and working alongside all of you on our projects. Please take the time to explore the many things you can help us with this new year and maybe, just maybe, make a new friend or two or three. Starting with a very busy January, please join us at our regular program on the 29th when we will learn about the Tumacacori Mission presented by a National Park Ranger. January 17: Military Families Baby Shower planning meeting at 10:00 a.m. in the Kino Conference Room. Join me in welcoming any challenges that may come our way, and supporting our fellow women in our community.